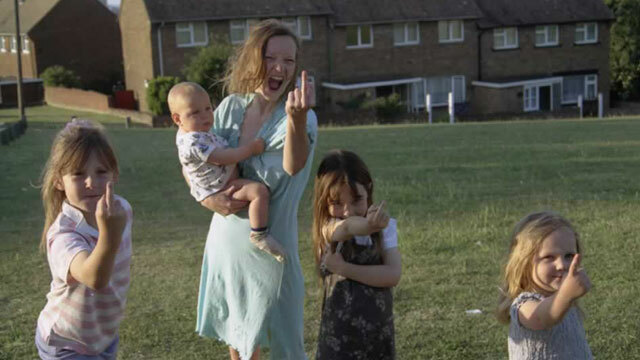 The 2003 Oscar winner, this film is a searing and intimate portrait of a single-mom and her 4 children in contemporary Britain. So you want to make movies, do you? Feature films? You’re “realistic” though at least: you don’t want to helm the latest super-hero franchise, but you’d like to be able to make small, personal films on modest budgets. You’d like to have idealistic producers and financiers dedicated to your vision and talent, and wouldn’t mind flattering writeups in Filmmaker Mag and warm receptions at Sundance. Well then this is the type of short film you need to make. Andrea Arnold is the young filmmaking treasure of the UK, a nation rich in filmic traditions, but notably insecure about its standing in the world cinema community. She has been held up as the emblematic icon of the the country’s generous production grant system—funds from the UK Film Council in 2003 directly lead to the creation of this short film, the subsequent success of which won Arnold both Oscar and a sustainable filmmaking career. It is an older short film than we generally feature, but this week has earned Arnold quite a bit of talk as her third feature film, a controversial re-telling of Bronte’s Wuthering Heights (Heathcliff is black! ), has caused a stir at the Venice film festival. Wasp is the realist tale of a young modern woman, mired in poverty, who desperately wants something for herself aside from the oppressive limitatons of being a single-mother of four. Despite the responsibility she bears, when an old crush unexpectedly resurfaces she takes the opportunity to go out on a date, behaving agonizingly irresponsibly. Do not be scared off by its long runtime, it is a short film that is truly phenomenal in story, subject and technique. If Britain has a filmmaking movement worthy of study in World Cinema 101, then it is surely British Social Realism. A potent combination of Italian Neo-Realism’s minimalist production style with Soviet Constructivist preoccupations with social class, the movement had its hey-day in the 60’s with exemplary films created by the likes of Ken Loach, Mike Leigh and Lindsay Anderson. Relatively fallow for several years, Wasp has been credited as reviving the genre in the UK, and many recent, award-winning short films have mined this territory. The short has gained the status of modern classic through Arnold’s sensitive humanistic approach, combined with modern filmmaking techniques. It is a bit of gushing, but it is phenomenal how much this film gets right. First its shooting style. Hand-held photography has been overused in recent years, but Wasp in 2003 used it properly. Arnold expertly mixes extreme closeups and extreme long-shots to set the scene and the create visual coherence, yet preserve a fly-on-the-wall intimacy. Shots that focus on the characters give way to well-composed shots of nature, combining the staid, naturalist impulses of Japanese cinema with action-oriented shaky cam. The sequence where the family walks down to the bar in particular is a masterpiece. The level of deftness in the writing and presentation is also stellar. Wasp is a film populated by gray characters, and its sequences provoke such mixed feelings in the audience. While the mother’s actions are unconscionable, they are also understandable. She is young herself, and her neediness is so nakedly presented. The way she gets tarted up for the date, the Beckham-connection that she asks her daughter to stop re-telling, are tell-tale signs of a woman who needs something to feel good about, but has precious little to draw upon in her own life. Even the old suitor, he is so expertly set up as a heel: the smooth lines, the crappy car, the way he makes our young mother pay for the first round—we are prepared to hate him, but that is expert manipulation on Arnold’s part. Like a young Hitchcock, she draws the tension out so slowly and mannerly that we are prepared to snap, yet, from his perspective, trying to get a young girl into bed is really not so unexcusable, ignorant as he is of the context she has placed her young children. The hidden desperation of young women is Britain is a topic that has suited Arnold well, it is territory she mined in 2009’s indie-hit Fish Tank, a film that featured excellent acting from Michael Fassbender among others. Directing the actor is an undervalued skill in short film, and Wasp is notable for the performances Arnold receives. The child acting particularly, a difficult proposition for any filmmaker to do well, is nothing short of astonishing. With limited focus, they managed to be wholly formed characters; the performance of the elder girl who must frequently assume the role of surrogate mother, being especially poignant. I mention that Wasp has achieved the status of modern classic, so it behooves you to watch. We’re in the slow season for short films, so dramatic live-action has gotten the short shrift on this site in the last few weeks, but this is a perfect reintroduction. To consider oneself a short film fan, I would almost say Wasp is mandatory viewing. Enjoy.